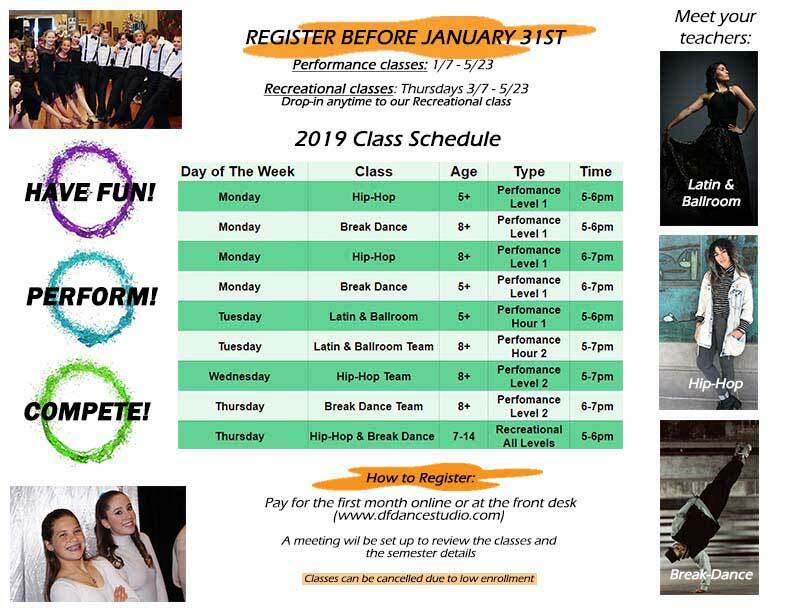 Kids dance class pricing. Children dance studio in Utah. Welcome parents! Please fill out the form below and our Youth Program Coordinator will reach out to you. Please look before for our brochure and studio policies. Currently taking new kids! Please enroll before August 30th! Please read through this important information to get a clear picture of what to expect. Please bring dancers in clothes that are easy to move in. Sneakers are best for our Hip Hop & Break Dance, while shoes with smooth soles are best for Ballroom & Latin. We want kids to focus & get the most out of their dance classes, so parents are asked to stay outside the classroom. We do have couches in the hallway but please understand that space is limited. We encourage you to run an errand, read a book in the car, go to the library, take a walk or go shopping - take some "you" time while your child is in class. Please arrive and pick up on time. Students must be dropped off and picked up within 10 minutes of the start or end of the class. Please DO NOT drop off at the front door. Please pull into the parking space. You are welcome to use all parking areas in front of the studio. Please, please, PLEASE SLOW DOWN! We have children that we all love & want them to be safe! Please be aware & careful. All studio communications will be done via email, text or phone call. It is each parent’s responsibility to provide a good email address & phone number - we want to be able to reach you & keep communication lines open. 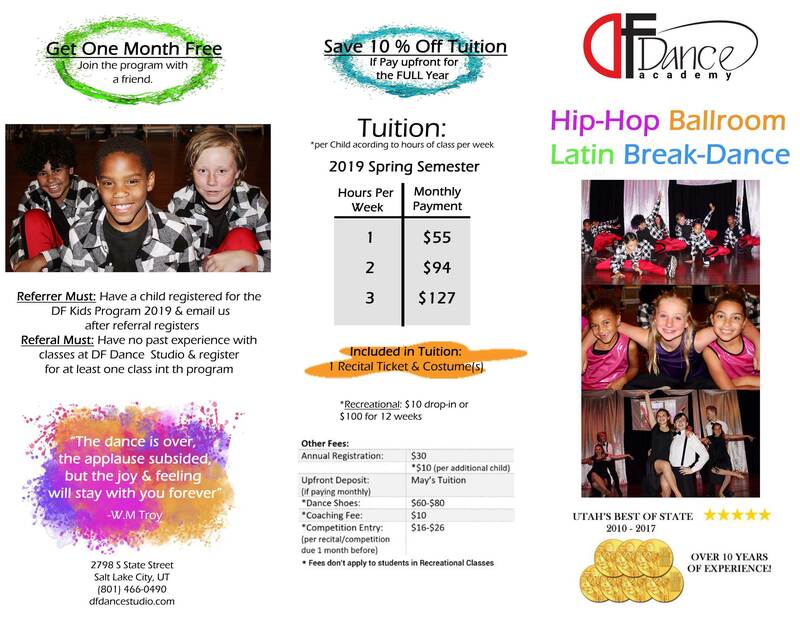 DF Dance Kids has made every effort to be considerate of holiday and school scheduling. A schedule of the semester is available online at the beginning of each session so families can plan ahead. Sorry, no refunds for missed classes. Are the kids going to compete? Our program focuses on providing high quality dance lessons with a non-competitive focus for most of our classes. The only classes right now that compete are our youth ballroom classes. We find this gives the students a goal to work for and is a popular way to get involved in the ballroom community in Utah.